Phil began his baseball career here in 1918 with the Knights of Columbus team, winning several City championships. In 1922 Phil joined the Senior Cataracts ball club. Phil was on nine Niagara District championship teams and twice went to the Ontario finals. Phil played semi-pro ball in Western New York. 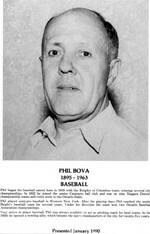 After his playing days Phil coached the senior Bright's Baseball Team for several years. Under his direction, his teams won two Ontario Baseball Association Championships. Very active in minor baseball, Phil was always available to act as a pitching coach for local teams. In the 1920s he opened a bowling alley which became the sports headquarters of the City for twenty-five years.